Spring Fun Guide Fantastic ideas for spring fun with kids in Niagara. 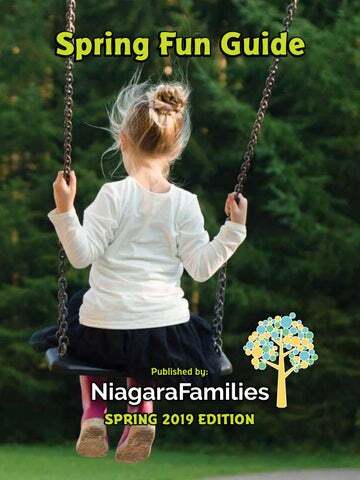 Welcome to the spring issue of the Niagara Families magazine! nside you’ll find the best that Niagara has to offer in the spring. This issue is filled with activities and events, including a list of March Break camps, Easter egg hunts, birthday party venues, and more. Contact Us… https://www.niagarafamilies.com www.facebook.com/NiagaraFamilies info@niagarafamilies.com We do our best to provide accurate, useful information about events and activities in the Niagara Region. This information (such as times and locations) is gathered from user submissions, press releases, local newspapers, other websites, signs around town and word of mouth. We do our best to confirm details before they are published. Sometimes details may change. Whenever possible, we strongly encourage you to confirm the details before you go. Green Your Home – Take a tour through your busy household with your kids and discuss the ways that your family is taking care of the earth, and the ways that you could take even better care of the planet. Make a poster as a family to remind everyone of your new commitments to greening your home. Enjoy ‘Lights Off’ – Enjoy dinners and bedtime stories by candlelight and take some ‘lights off’ time as a family for a month. I’ve noticed the ambience of candles on the dinner table is an automatic cue for the kids to bring their energy down. Except for our toddler, of course. Nothing can stop that one. Organize a Swap – Create a date for your kids and their friends to have a swap meet. Previously loved toys, games and books find new life, and it’s a great way for the little ones to see the value in re-using and re-purposing items. Upcycle Crafts – I think kids’ crafts can be beautiful and functional. Rather than try to make magic with macaroni, why not tackle some beautiful upcycled crafts, such as toilet paper birdfeeders, tin can wind chimes, or melt broken crayon bits into colourful crayon blocks. Thinking of doing some spring cleaning? Want to get rid of clutter around the house? There are many organizations across the Niagara region that will accept gently used clothes, toys, and household items. Goodwill Niagara 572 Niagara St.
Salvation Army 50 Clarence St.
St. Catharines Bibles for Missions 118 Lake St.
Christian Benefit Shop 254 Grantham Ave.
Community Care 12 North St. Goodwill Niagara 495 Welland Ave. Goodwill Niagara 228 Glendale Ave.
Easter Egg Hunts in Niagara Looking for Easter Egg Hunts in Niagara? There are so many to choose from, all with extra activities and lots of fun for the kids! Beamsville Beamsville Annual Easter Egg Hunt When:	Saturday, April 20, 9:30am Where:	Beamsville & District Lions Community Sports Park 5100 Fly Rd., Beamsville The Lions’ Easter Egg Hunt features entertainment for youngsters and a chance for each age group to find the magic egg that wins a bicycle. In addition to free coffee and hot chocolate from Tim Hortons, the Lions provide free hot dogs. Participants are asked to donate a non-perishable food item that will be given to Community Care of West Niagara. Join the Stamford Volunteer Fireman’s Association for their annual egg hunt in Fireman’s Park. There is an entrance fee of $3 per child or one non-perishable food donation per child. Children are divided into groups by age and are given 10-15 minutes to collect as many eggs as they can. Say ‘Hi’ to the Easter Bunny, enjoy face painting, colouring contests, guessing games, and the fish pond. Refresh with snacks, hot chocolate, coffee, and cold drinks. Annual Bunny Trail When:	Saturday, April 20 Time: 10am-1pm Where:	NOTL Community Centre 14 Anderson Lane Niagara-on-the-Lake The event will kick off at 10am sharp with the Kinsmen/Niagara Nursery egg hunt. Following the egg hunt, there will be games, entertainment, touch a truck, and crafts. For local children 12 yrs. and under. Three hunt areas: 3-5 yr olds; 6-9 yr olds; 10-12 yr olds. One “golden egg” prize per area. Each participant is responsible for bringing their own basket to collect eggs. A whistle will be blown at 11:00 am SHARP to announce the start of the hunt. The Thorold Annual Easter egg hunt is hosted by the Thorold Station 1 Volunteer Fire Fighters. Kids will be divided up by age category. Please bring a non-perishable food item for friends at Community Care and make sure to come early to register to win one of the big prizes. Join the Easter Bunny and have fun searching for an Easter egg! Join Cindy Cook from Polka Dot Door for two Easter shows: 10am and 12pm. There will be an Easter Bunny meet and greet before each show and a bunny hug after. Face painting by Niagara Face Painters: 10:00 am. Egg hunt: 11:00 am. Egg return/prize bags: 11:15 am. Free open swim: 1:00 - 3:00 pm. Free family skate: 3:30 - 4:30 pm. All events are subject to change without notice. Ridgeway Ridgeway Easter Egg Hunt When: Saturday, April 20, 10am-12pm Where: Downtown Ridgeway Join the Ridgeway Easter egg hunt, where you can meet the Easter Bunny, hunt for eggs, and join in a scavenger hunt! Welland Annual Easter Egg Hunt When:	Saturday, April 20 Where:	Merritt Island, Welland Time:	10:00 am-3:00 pm Hunt Times & Ages:	Ages 1-3:	10:00 & 12:30 Ages 4-7:	10:30 & 1:00 Ages 8-10:	11:00 & 1:30 Ages 11-15:	11:30 & 2:00 Family:	12:00 & 2:30 Enjoy face painting, trivia, carnival games, entertainment, fish pond, bouncers, the Easter Bunny, clowns, refreshments, fire truck display, Fun Express train, and more surprises. Donation to participate is $3.00 per child for any of the times for their age or any of the family hunts. (Anyone can participate more than once for an additional $3.00 donation each time). Activities and games tickets will be 50¢ each. Activities range from 1 to 4 tickets. Tickets won may be cashed in for prizes at the prize tent. 25 Rainy Day Activities It doesn’t hurt to have a list of activities on hand for those days when the rain just doesn’t want to clear up. My kids have fun playing on their own but eventually become bored and turn to me for ideas. Here is a list of EASY and fun activities to keep kids entertained on those days when you’re stuck indoors: 1. 2. 3. 4. 5. 6. 7. 8. 9. 10. 11. 12. 13. 14. 19. 20. 21. 22. 23. 24. 25. Brock Youth University (Grades 2-8) Art, science, engineering. Location	Brock University, St. Catharines. Phone:	905-688-5550 Carousel Players (Ages 4-10) Drama camp. Location:	85 Church St., St. Catharines. Phone:	905-682-8326 Club Jump (Ages 4-10) Gymnastics camp. Location:	50 Niagara St., St. Catharines. Phone:	905-688-1111 Futbol Niagara (Ages 8-16) Focus on skills, drills, and games. Location:	369 Glendale Ave., St. Catharines Phone:	289-257-8083 Heartland Forest (Ages 5-12) Outdoor adventure camp. Location:	8215 Heartland Forest Rd. Niagara Falls Phone:	905-356-7384 Niagara Childrenâ&#x20AC;&#x2122;s Museum (Ages 4-14) Painting, sculpture, and crafts. Location:	St. Catharines, Niagara Falls, Welland. Phone:	905-356-1514 Niagara Falls Community Health Centre (Grades 4-8) Cooking, fun games, outings, and physical activity. the hardest thing they have ever done, they say. Still in their 40s, they plan to foster for a few more years, take a break and then come back to it when Bill is retired and can be a “full-time foster dad.” “It’s kind of our thing now, our life’s work,” says Bill. There are more than 450 children in foster care in Niagara and an urgent need for more foster parents like the Durrants. For more information about how to become a foster parent, visit facsniagara.on.ca, follow us on Face Book or Twitter or call (905) 937-7731. Talk with someone you trust, share with them how you are feeling. Let your care provider know that you think you may have some anxiety or depression. You can also reach out to a therapist who specializes in maternal mental health. Recognize that this is a major life change. You may need to reduce some of the stressors in your life. Transitions take time to adjust to and allow your self the flexibility to learn your new family. Some things on your “to do” list may just need to wait. If you already have children, think about where you can get support - spouse, relatives, friends, and childcare. Children benefit from knowing what to expect and having a routine in place. Try and think about respite for your child(ren) for when baby comes. Take moments to take care of yourself. Selfcare doesn’t mean having to do elaborate things - it can be taking a bath, listening to music, reading a book, or going for a walk. Mom Minutes Welcome to our series where we meet amazing local moms. We’ll hear about their journeys, inspiration, and best parenting tips. Meet Meera Filipe. We are a family of three. My husband, my baby girl who is 13 months old and myself! We have lived in Beamsville for six years now. My husband is from Hamilton and I’m from St. Catharines. We struggled with infertility for six years. Our daughter was finally born via IVF, our fourth and LAST embryo. She came into this world totally unexpected at 25 weeks weighing just a pound. We call her our miracle baby. We start off every morning with a drive as a family (Tim Hortons run for a double espresso for hubby) followed by the scenic rounds in our town of Beamsville. Hubby works seven days a week so it’s just usually me and my daughter. Lots of play time, singing and snuggles. She loves to be outside, so we spend lots of time walking or going on drives. She loves swimming as well. working every day. Also, since our daughter is a micro-preemie, we have to be very careful about germs, especially this time of the year, so it becomes very isolating in the winter months. Niagara Mom Meera Filipe and her daughter. What’s been your best parenting moment so far? Watching my daughter grow and thrive. She came into this world totally unexpected and fought for life and overcame so many struggles. To watch your child do that is just the most amazing thing! What do you do to take time for yourself? After my daughter goes to sleep I find time for me. Whether it’s reading a book, cooking, catching up on social media, having a bath, or going out with my girlfriends. What brings you great joy? Looking at my daughter. I stare at her all day, every day. It’s hard to believe we made that little miracle. What’s your best parenting tip? You know your child best. Do what you feel what is right for your child. Go with your gut. If you feel like something isn’t right…voice it. You are your child’s advocate! Don’t compare your child to others and don’t rush things! What is your family’s favourite thing to do in Niagara? There are so many fun things to do! We love the Butterfly Conservatory and Bird Kingdom in Niagara Falls. We love driving in the Beamsville bench... exploring all of the amazing wineries and fruit stands, local food, etc.! If you have a friend, sister, co-worker, etc., you think would be a great candidate for our Mom Minutes feature, please email us at info@niagarafamilies.com! Sleeping Like a Baby Suggestions for coping with infant sleep issues. Deciding what works best for your family. Article Contributed by Heather Boyd, O.T.Reg. (Ont.). What I would have liked to hear back then, and what I hope may help some of you going through the challenging early months (and years!) of parenting is: 1. Babies are hardwired to wake up often. A babe who wakes up every 2 hours at night for months may still fall into “normal” for sleep expectations, regardless of all the My son was what some would call a “bad ‘tricks’ we try; sleeper”. I look back on this time and would 2. Babies are also hardwired to be close to describe him not as a “bad sleeper” but as a mom. Current guidelines are to room share baby who couldn’t sleep. for at least 12 months, and sharing a room is At one point it was so exhausting I emailed believed to reduce the risk of SIDS. Being Elizabeth Pantley, author of the “No Cry Sleep close meets baby’s needs and also reduces Solution”, bleary-eyed and sobbing, hoping the energy needed to be responsive to your she had the magic solution to our sleep woes. baby at night; She was empathetic, but had nothing 3. Understanding what is normal can make particularly helpful to add to what I already sleep seem so much better, even if nothing knew from reading her book and many other else has actually changed; books on the topic. 4. Babies’ needs are high for a reason. They are not manipulating parents’ behaviour in Although I am an occupational therapist, I was order to control parents; they are manipua parent first and, being sleep deprived and lating in order to have their needs met. in the thick of it, I needed someone who knew 5. Mama’s instincts count. If you feel there is how to break this down for me -- to problem something that is causing sleep troubles, solve with me and to normalize what infant keep sleuthing. sleep really is. When I became a mom for the first time, I quickly realized that sleeping like a baby was anything but! Although I eventually found my way to credible information about what to expect in terms of sleep, the first two years were full of sleep deprivation, bad advice, self-doubt, and exhaustion. Serving clients in the West Niagara area and offer hospital births at West Lincoln Memorial Hospital in Grimsby. Serving clients in St. Catharines, Thorold, Pelham, and NOTL. Midwives of East Erie Serving clients in the Dunnville and Simcoe area. Renaissance Midwifery Serving clients in Welland, Niagara Falls, Fort Erie, and Port Colborne. Are you planning a birthday party? Looking for a venue or great entertainment? Weâ&#x20AC;&#x2122;ve got you covered with our Birthday Party Guide! It includes a list of indoor birthday party venues in Niagara as well as entertainment and supplies. Cindia and the Shark Musical 905-324-7113 Puppet Shows. Creative Faces	905-714-5893 Face painting. Thorold Da Bath Bomb Co.
Mick & Angelo’s 7600 Lundy’s Ln., Niagara Falls Free kid’s meal with the purchase of an adult entrée, after 4pm. Children, 10 years and under, receive a Tuesday free kid’s meal for each regular menu item Montana’s valued at $15 or more. 327 Lake St., St. Catharines Free kid’s meal with the purchase of an adult entrée. Kids eat free (dine-in only), 10 years old Cracker Jack’s and under. Minimum purchase of $13 in food per person excluding beverages and 207 Keefer Rd., Thorold taxes. One child accompanied by an adult. Free kid’s meal with the purchase of an adult entrée. Free kid’s meal with the purchase of an adult entrée. The Manhattan Bar and Grill 405 Vine St., St. Catharines Free kid’s meal with the purchase of an adult entrée. Pizza Hut 294 Lake St., St Catharines or 841 Niagara St., Welland Free kid’s meal with the purchase of an adult entrée. Big Marco’s 274 Fourth Ave., St. Catharines Free kid’s meal with the purchase of an adult entrée. For kids 10 years old and under. Wednesday Gord’s Place 84 James St., St. Catharines Free kid’s meal with the purchase of an adult entrée. Frontier BBQ & Smokehouse 6519 Stanley Ave. Niagara Falls Children, 5 and under, eat free for breakfast Saturday and Sunday, and dinner Wednesday to Sunday. Frontier BBQ & Smokehouse 6519 Stanley Ave., Niagara Falls Children, 5 and under, eat free for breakfast Saturday and Sunday, and dinner Wednesday to Sunday. Friday Frontier BBQ & Smokehouse 6519 Stanley Ave., Niagara Falls Children, 5 and under, eat free for breakfast Saturday and Sunday, and dinner Wednesday to Sunday. Children, 10 years and under, eat free with every adult meal purchased. Children, 5 and under, eat free for breakfast Saturday and Sunday, and dinner Wednesday to Sunday. Frontier BBQ & Smokehouse 6519 Stanley Ave., Niagara Falls Children, 5 years and under, eat free for breakfast Saturday and Sunday, and dinner Wednesday to Sunday. Mandarin 366 Bunting Rd. St. Catharines Children, 5 – 12 years, are half price for the buffet. Children, 4 years old and younger, are a $2 sharing price. Boston Pizza 333 Ontario St., St. Catharines 221 Glendale Ave., St. Catharines 934 Niagara St., Welland Buy a $5 Kids Club Card, and receive one free kid’s meal per $16 adult entrée. Can be used up to five visits. niagarafamilies.com 3 things not to miss on NiagaraFamilies.com this Spring! Looking for activities and programs to keep kids busy during March break? We’ve got you covered with our massive list of fun activities and events happening over the break in Niagara. Enjoy afternoon tea, brunch, vendor markets, or kids’ activities this Mother’s Day! We’ve put together a list of some family-friendly Mother’s Day activities in Niagara this spring. 3. Victoria Day celebrations. We’ve listed all the best family-friendly Victoria Day events happening around Niagara. Enjoy the festivities and fireworks as your family celebrates Victoria Day!